Spread Awareness! Different Colors for Causes! Our NEW sweet 6in Awareness Angel mouse makes a thoughtful gift for a variety of special causes. 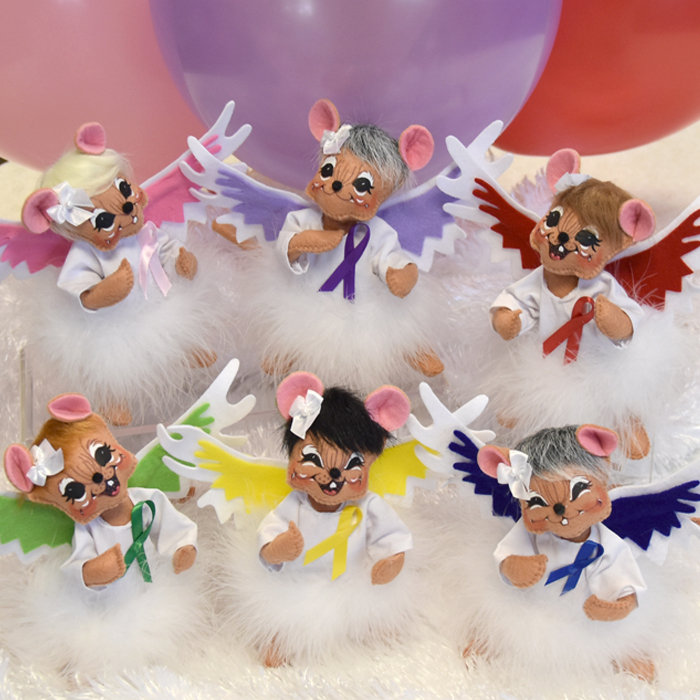 You can personalize this mouse by choosing the hair color and an awareness color on the wings and ribbons. Annalee is proud to offer six distinct colors representing and aiming to bring awareness to well-known causes. We have provided a chart of colors and causes – to uplift, educate and advocate. This sweet angel mouse makes a thoughtful gift for a variety of special causes. She wears a white gown with fluffy white boa trim and a white bow in her hair. Personalize this mouse by choosing the hair color and awareness color shown on the wings and ribbon. See color chart below for reference. Create an extra special gift by adding an embroidered base for just $9.99! Choose the base color and a name or special message that our team will custom embroider at our headquarters in Meredith, NH!